We measure the progress of our planet around the sun by looking at a bit of paper stuck to the wall, or by looking at those little electronic devices that can also tell you what day of the week it is and in what particular month that day falls. Each revolution of the earth around the sun is called a year and we don’t just mark the passing of each year by looking at bits of paper but by events or anniversaries. In some places, these events become quite big and are eagerly looked forward to. Such as cheese rolling festivals in England, or the burning desert stuff in America. Birthdays, Christmas Day, ANZAC Day, Easter and Halloween are similar events. Some like Le Tour De France or Edinburgh Military Tattoo last a couple of weeks, whilst others are over and done with in one day. One event that boat orientated people eagerly look forward to is the Boat Show. No matter what part of the world you live in, there is a major boat show being held each year in a major city, whether it is in Europe, America or here in Australia. Last weekend saw the Sydney International Boat Show and it saw the crew of La Mouette rising early to catch the river cat to get to Darling Harbour in Sydney for the show. After all, if you are going to the boat show, why not catch a ferry and go by water. The run from Parramatta, up the Parramatta River onto Sydney Harbour is quite a pleasant experience. Plus it means that you don’t have to worry about traffic and parking and all that sort of stuff. We haven’t watched any of our favourite sailing channels lately because we have been watching Le Tour de France for the last three weeks, but each of the channels usually devotes an episode to a major Boat Show in their area – usually Annapolis or Southampton. Although La Mouette does have a YouTube sailing channel, albeit with one video, however, we won’t be making that two episodes with one dedicated to the Boat Show. That particular task falls on this humble blog. So thus we cut to the chase. This year, the boat show wasn’t really worth a YouTube episode and not really worth a blog either, but blog topics can be hard to find, so a less than spectacular Boat Show makes an excellent subject for a blog. We quite enjoyed the shows over the last few years. Comparing inflatable dinghies, checking out water makers, clambering aboard the fancy floating gin palaces and generally looking at all the exciting shiny things we could buy and attach to our boat. But this year something seemed to be missing. We tend to like the Bavaria yachts over the Dufours and Jenneaus, but there wasn’t really much in the way of Bavaria yachts there this year. We had a look at some Dufours and a Benneteau, but they just left us feeling flat. We didn’t like the stying. Outside or inside. These weren’t boats that we would ever consider owning, not our style, nor would they suit our needs. In the marina part of the show, there wasn’t very much there that excited us. Nothing there floated our boat, so to speak. I wonder how many times that phrase has been used in this context? Considering that there wasn’t much in the marina, it took us all morning to get through it. Oh, the highlight was going aboard Lisa Blair’s boat, Climate Change Now. 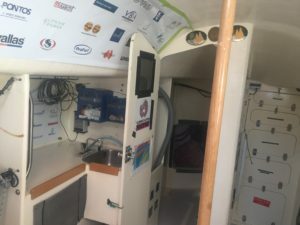 This was the boat that she solo circumnavigated around Antarctica in, losing a mast in the process and putting up a jury rig to get it back to South Africa for repairs. We also had a chat with Lisa. The boat was very utilitarian indeed, as you would expect, no teak or varnishing, no bar fridge and certainly not a gin palace. This was a boat meant to take some heavy weather. Time for some lunch and a beer and then it was the Exhibition Centre part of the Show – two floors of boating extravaganza. Sort of. The bottom floor was mainly trailered stink boats, jet skis and dive equipment. Not much for the intrepid sailor at all. It didn’t take long to do this part at all, about the time it took to walk around the inside of the building and back to the exit. Fingers crossed that the next floor would be more productive. This was more like it, shiny boating stuff, electronic boating stuff and lots of stands with gimmicky products that look interesting. It’s funny how shows, street markets etc always seem to specialise in gimmicky stuff. Like novelty wine bottle holders, or revolutionary fender design that will change the face of boating forever, revolutionary covers for those revolutionary fenders. All those things that make you wonder how you lived life before they came onto the scene. The very same things that you buy and take home and surprise, surprise, they end up out on the footpath ready for collection during the next council clean-up, or end up cluttering up cupboards on your boat or in your garage. Revolutionary stuff tends to be like that, screams in your face that change is way overdue and when you let it into your life, the biggest thing it does it disappoint, and then it’s just clutter. Last year we ended up coming back with invoices for a fridge and a dinghy. This year we just bought a folding chair (to pair up with the one we already have). Of course we got the obligatory boat show discount, which was way offset by the breakfast, beers and entrance fees we paid on the day. All at premium prices of course. No boat show discount at the bar or cafeteria however. Even the collection of catalogues and pamphlets was significantly reduced from last year. It just seemed to be the same as last year where we chatted to a whole host of stall holders, but this year it was, been there, done that. There wasn’t much that was new. Except for a really cool 20 footer gaff rig trailer sailer. The 2018 Sydney International Boat Show summarised in one word? Meh. It’s a day out and certainly chalked up a lot of steps on the pedometer without chalking up a lot of dollars on the credit card. But it doesn’t beat a day out on the water actually enjoying your boat. That’s this weekend, but more about that next time. Hi Andrew and Debbie. 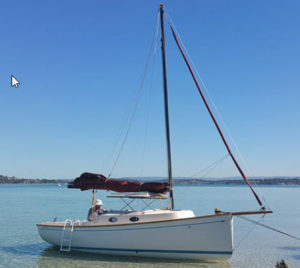 I have just come across your blog and am glad to see my dads old yacht is in good hands. It was his pride and joy and i am sure he would be happy seeing it getting lots of use and being well maintained. I have been following in my dads footsteps and am now living aboard a small houseboat that we started building before he passed. Im also restoring a little jarcat at the moment, so i might see you down the Hawkesbury some time!